In 1948, Pak Carpet Industries, PCI, began its journey with the trade of handmade carpets. By 1951, PCI established Pakistan’s first handmade carpet manufacturing unit, dedicated solely for export. 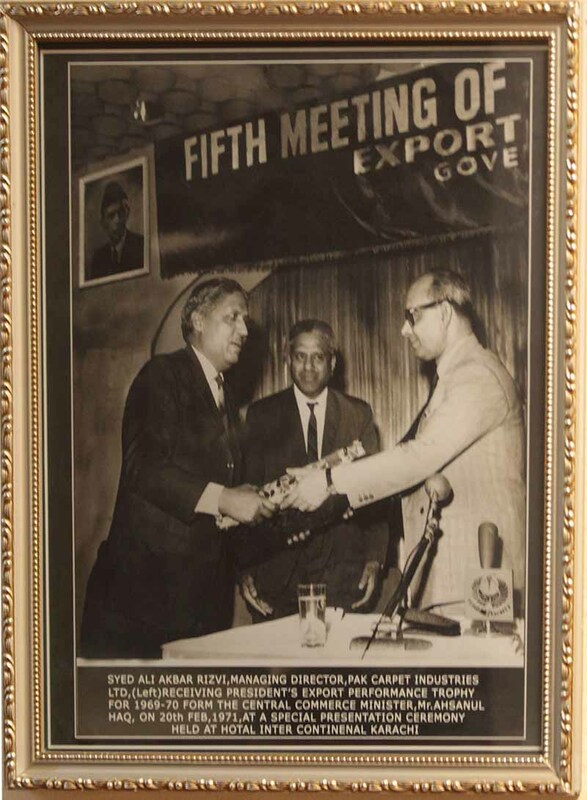 Owing to the extraordinary performance of the company in the international market, PCI was awarded the President’s Export Trophy in 1969. Weaving through success, by 1978, we developed our own needle punched carpet production line. And by 1984, we had further developed our capacity and began the production of woolen machine made carpets. The journey continued with the motive to keep on moving and expanding. Even today, with a strong foothold in the market we are driven by our mission, to provide our customers with total solutions. We aim to consistently innovative and display passion in whatever we do. Till date, we are the largest retailer of machine made carpets in Pakistan. PCI Materials focuses on the production of Synthetic Carpets, Non-woven Fabric, Geo-textile and specialises in engineering grade textiles to meet the requirement of automotive textile industry. Through smart tactics and strategy, in 2014, PCI Materials further diversified into manufacturing of Plastic Packaging by adapting blow moulded technology to cater to the needs of the growing packaging industry of Pakistan. PCI Automotive is the manufacturer of auto-parts for OEMs in Pakistan’s auto industry. Apart from being a pioneer in automotive carpet manufacturing, PCI Automotive also gained expertise in manufacturing plastic, PU formed and sheet metal parts. Being one of the best vendors in the industry, PCI Automotive has always focused on meeting or even exceeding OEMs’ expectations in terms of quality, cost and suppliability. Started Trading Of Hand Made Carpet In 1949. Established Pakistan’s First Hand Made Carpet Manufacturing Unit In 1951. Started Export Of Hand Made Carpet In 1951. Started Retail Of Machine Made Carpet In 1965. Won President Export Trophy In 1969-70. Started Manufacturing Needle-Punched Carpet In 1978. Started Manufacturing Of Woolen Machine Made Carpet In 1984. Started Manufacturing Automotive Carpet For Suzuki in 1984. Started Manufacturing Automotive Carpet For Toyota in 1992. Started Manufacturing Automotive Carpet For Honda And Other Oems Since 1995.
tarted Manufacturing Wiper Arm & Linkage Assembly In 2004. Inauguration Of Bin Qasim Manufacturing Facility In 2008. Started Manufacturing Of Plastic Injection And Blow Molding Products In 2009. Started Manufacturing Of Motorcycle Seat Assembly For Yamaha Motors In 2014. Started Manufacturing Of Plastic Cans For Lubricant Industry, Shell & Chevron In 2015. Started Manufacturing Of Motorcycle Seat Assembly For Atlas Honda In 2017.